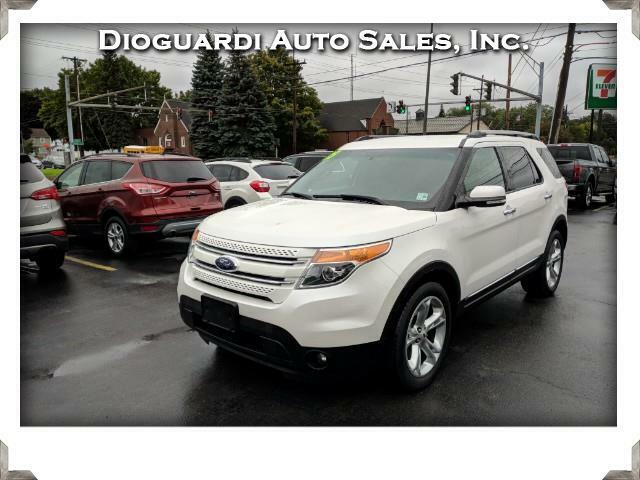 Used 2015 Ford Explorer Limited 4WD for Sale in Rochester NY 14609 Dioguardi Auto Sales, Inc. The Ford Explorer is one of the better known crossover SUVs, one that has been around for quite some time. With a standard turbocharged V6 engine that makes 290 horsepower at 255 pound-feet of torque, it’s got some serious get-up-and-go. As safe as SUVs come, this vehicle features sway and traction control, front and side airbags and front knee airbags. Upgraded trim levels will net you a backup camera, collision control and warning system with lane departure warnings. With 80 cubic feet of cargo room, which can increase when you fold down the 60/40 splitting bench of the rear third-row, there’s room aplenty for that tempting weekend camping trip. The MyFord Touch interface (optional upgrade) adds GPS, voice-activated console control, Bluetooth and streaming audio and video, yet can be sluggish and unresponsive. Beautifully designed clusters of gauges augment the soft-touch dashboard, with a decadent and spacious interior that could leave a little bit more of headroom for taller passengers. The limited 3-year/36,000 mile bumper-to-bumper warranty should be upgraded to protect your investment in this capable and versatile crossover by Ford.